So much learning just beyond the arrow. A view of Swan Lake from the hill. 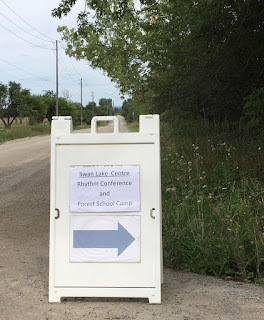 This year, as I have for the last three years, I attended the incredible, difficult-to-describe week of shared learning known as "The Rhythm of Learning in Nature". I say difficult to describe because ostensibly it is professional development, but it is hard to summarize the fullness of experience and knowledge that is shared among educators for whom Malaguzzi's "Nothing without joy" is part of their theory of learning. It has been made richer for me by the inclusion of my daughter in the forest school running alongside our educator experience; spending time with her and the other children in the meadow allowed me to revel in the powerful connections children make with a place when they have long, unhurried days to explore in it. Last year our group, including the forest school, were fortunate to witness the slow, fascinating metamorphic transformation of a newly above-ground cicada as it rooted into a tree and proceeded to emerge from its hard carapace. It became a symbol for many of us of how this week together changes us, allows us to break free of the "no, but" chains we bring to our teaching in our various contexts. This year was different for me, in that my daughter was now too old for the forest school site (and indeed her dear friends from the last years were likewise not returning) and as such I was making the trek to Swan Lake alone every day. I was happy, however, in that a truly inspiring friend who I had met through my volunteering with the YRNC was able to join us this year for the full week: Tanya Murray's handle on twitter is "Inspire Outside" and it is an apt choice. From day 1, I was excited for the learning and friendships that would grow in the process. 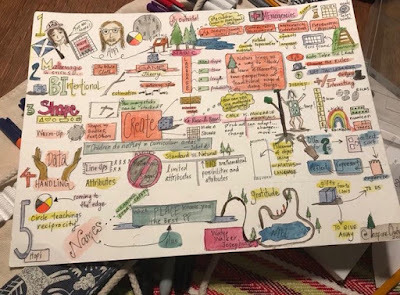 Tanya's sketchnotes are an example of the many gifts she shared with those of us at Rhythm this week. Tanya's overview sketch notes of our incredible week at Rhythm 2018. Photo by Tanya. Delight: a good way to sum up our interactions with Tanya (right) and Juliet Roberstson (holding her first sketchnote after a tutorial by Tanya). Photo by Tanya. Day 3: Tanya's pic, looking deeply at some mathemagic happening this day. This map at the Swan Lake/TRCA nature centre fascinated me, as someone who loves riverways and watersheds. It also drove home how far I was from my daughter who'd always attended this week with me. Swan Lake is just a stone's throw away from Lake St. George, another other the kettle lakes (seen here top-middle of the coloured land on map.) Home is at the bottom of the Etobicoke Creek Watershed, near the shore of Lake Ontario. A different landscape inhabited by different flora and fauna: Swan Lake woods ring with the songs of the pewee, phoebes, indigo buntings and blue jays. I received occasional texts from my kids, showing me rabbits and raccoons, and views of the lake from various parks. I missed them but was happy to be connected from afar by our love of the outdoors. The week at Rhythm continued to enrich my learning about learning, even though I was missing the opportunity to enjoy it alongside my daughter. Every year there are familiar faces that I honestly look forward to seeing all year, and also new people who may be strangers or often are friends through social media but never met. One of those new friends this year is Donna Indrakumaran, a Kindergarten educator I'd never met but knew through twitter. We discovered that though we work for different boards in the Peel region, we actually teach quite close to another in central Mississauga, with her teaching at Sts. Peter & Paul Separate School just a few minutes northeast of me at Fairview PS. Over the week I came to treasure Donna's outlook on teaching and learning alongside our children. One feature of the Rhythm that stands out is that we have a final day away from Swan Lake in which to share what we've learned with a wider outdoor-enthused audience. This Saturday conference is held at the beautiful Kortright Conservation Centre, and our main facilitator for the week becomes the keynote, while facilitators and attendees host smaller workshops. Juliet Robertson shared the same uplifting and mind-shifting stories at her keynote that had led us in playful discovery all week. 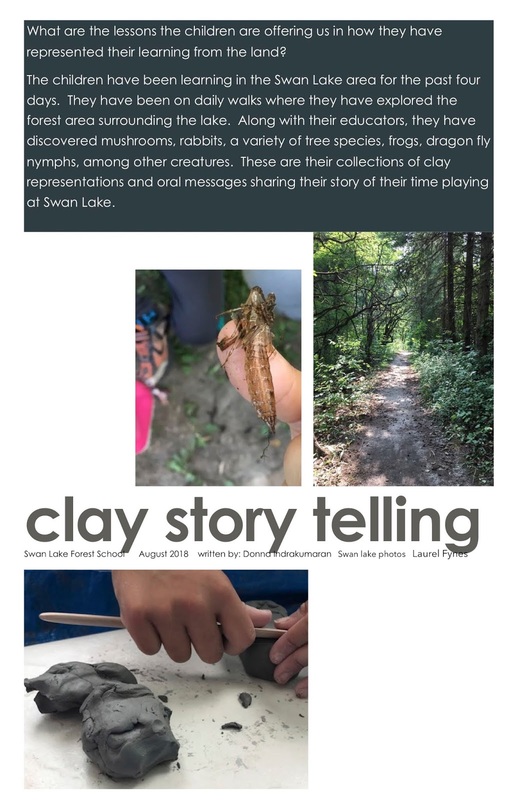 For our workshop, four of us combined passions and put together "Mapping Nature Connections" which included a favourite story (Mattland), simple core routines for getting to know and appreciate the place you inhabit (including sit spots), recreating our space by using clay artifacts to map, and looking at examples of work from the children in the forest school program in the meadow above Swan Lake. The workshop was given structure and meaning by Tanya whose work supporting educators of all grades in outdoor pedagogy inspired us all. The green oasis of Kortright's mostly maple-beech forest provided the perfect place for us to wonder about making place meaningful. Pictured top right and middle: Dominique reading Mattland. Bottom left: Donna's documentation and samples from the children's work at Rhythm. Right: Donna (centre) talking about the clay experience. Not pictured: Tanya, on my side of the circle. 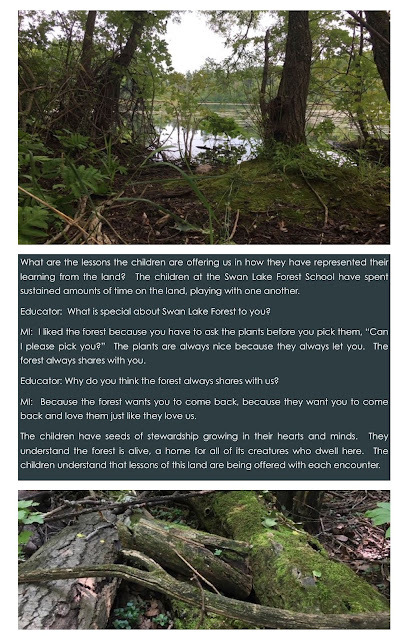 Donna's documentation captured the deep engagement of the school so beautifully, I asked her if she would like to share it here. Please enjoy her story, and feel free to leave comments for her here on the post, or direct to her twitter. Note: this documentation was also shared by Diane Kashin, the chair of the YRNC who makes this incredible PD experience possible. To see her post about Rhythm 2018 see here. When coming to Rhythm 2018, I expected to receive PD around Outdoor Education. What I did not expect was a spiritual experience, igniting a spark which has been smoldering for some time. Rhythm brings together people, pedagogy and place at Swan Lake in a transformational way - you will not leave the same as you arrived. Through conversations, reflections, active learning, sharing of food, and sharing of personal experience Rhythm attendees came together. Two of my children joined, playing at the Swan Lake Forest School. Each day they would share through conversations about their play, often telling me of mushrooms and frogs. They climbed trees and made paintings with mud. They quickly formed a connection with the forest, telling me about their hikes each day, and each new creature they found. They learned to rub plaintain on their insect bites, and lit fires after gathering wood. The land around them was enough. 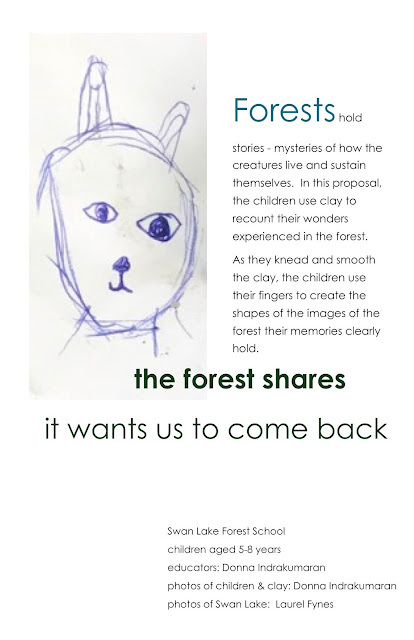 The documentation that follows was taken on a Thursday, after the children had been at the Forest camp for four days. I had met the children a few times before sitting down to play and document their learning. The documentation is a sample - a window into the children’s thinking. 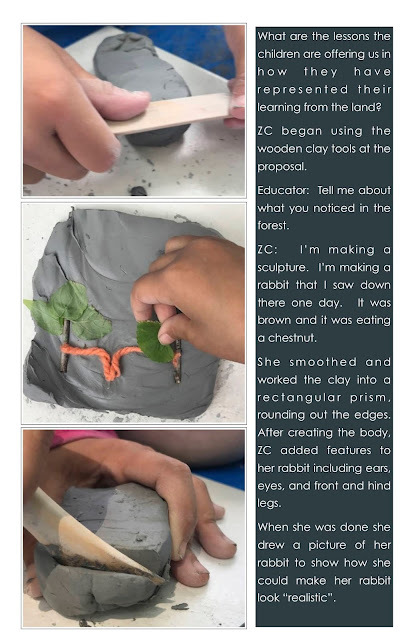 Although brief, the children’s connection to place is evident in their clay representations of the forest at Swan Lake. 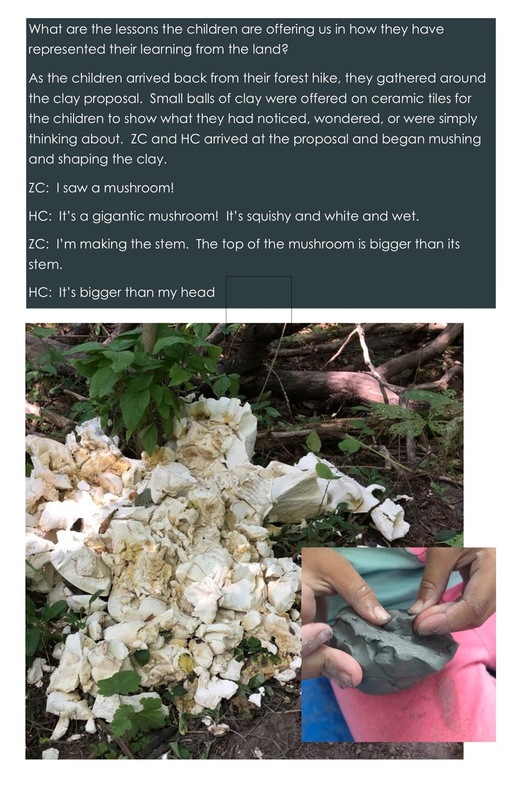 This documentation was shared with educators at the I am a teacher - get me outside! Conference held by the York Region Nature Collaborative at Kortright during a workshop in collaboration with Laurel, Tanya Murray and Dominique Leger. We would love to hear from participants at Rhythm 2018 and/or at the "I'm a teacher, get me outside!" conference. Please feel free to comment here, or wherever this post is shared (please tag participants if on social media). Thank you to my collaborators for such an incredible week!